Climbing Damavand, wish me luck! I’ve just made it to the summit of Damavand!!! Acabo de hacer cima en Damavand!!! Climbing a Volcano – Mt Damavand (5610m), Iran – Ready to go!!! I’m now counting down the hours left before I leave to Dubai International Airport . Tonight around 2:30am I will be landing in Tehran Imam Khomeini International Airport from where my new extreme challenge will start. This challenge was in my to-do list since I spotted this beautiful volcano in my last visit to Iran on December 2011, when I attempted a winter climb of Pasand Kooh in Alborz range. Today I’m leaving to Iran to attempt a crazy winter climb of the highest mountain in the Middle East and biggest volcano in the North Hemisphere, Mt Damavand (5610m). I did my first volcano last year (Mt Rainier, the biggest in North America), and since then I’m officially addicted to the sulfuric acid. This time I’m going a bit crazier since I’m doing a winter climb (2013 season already started) on the second hardest route in a country that is going a bit crazy these days (thanks to certain westerner governments). It normally takes 4-6 days but I’ll try to do it in only 3. The first challenge on this adventure will be to get a Visa on my arrival to Teheran. Right after that, with almost no sleep, I’ll be driving with Salim, a Teherani who knows the Mountain very well, to Nandal village (2400m) where to have some rest before we start our approach on 4×4 vehicle to Gusfandsara, and 5 hours climb to or first camp at Takhte Fereydoon hut (4300m), all of these in just one day. On Thursday I’ll do my summit push and back to the hut to celebrate and sleep before I head back to Nandal and Teheran. What it makes this climb somehow special is the difficulty of the ascent on a winter climb. The winter season may start from October to November and last to May and April. In this period climbing to Damavand summit is very tough and dangerous. Because of high wind speed and very low temperature, stormy weather conditions, too much snowfall, icy trails and other risks, winter ascend is graded as very difficult. 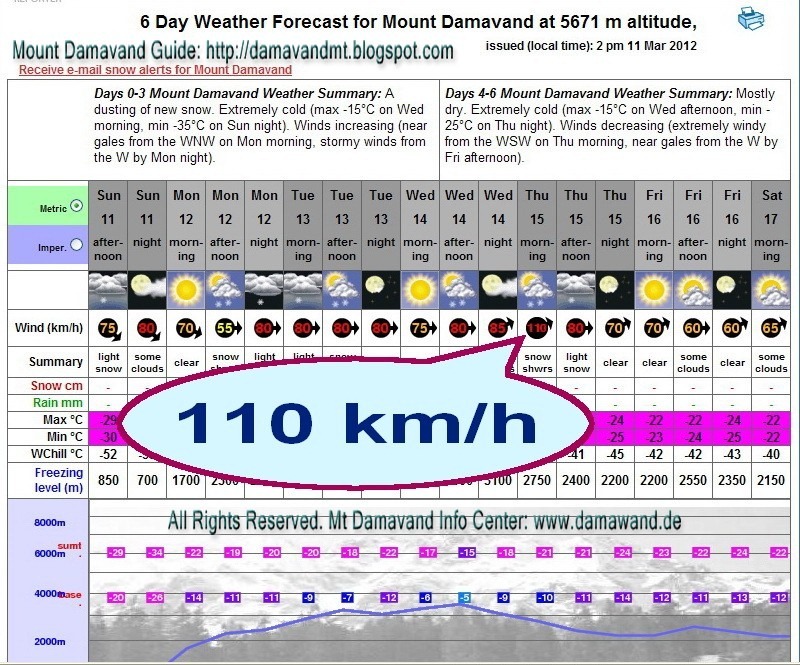 Damavand Weather could change to disastrous in winter, with strong winds more than 100km/h and freezing temperature below -70°C (-94 Fahrenheit). Right now the weather forecast looks quite frightening with temperatures ranging from -12C to -16C (thermal sensation -27C) at the top on the summit day, -6C to -10C (thermal sensation -20C) at the hut. 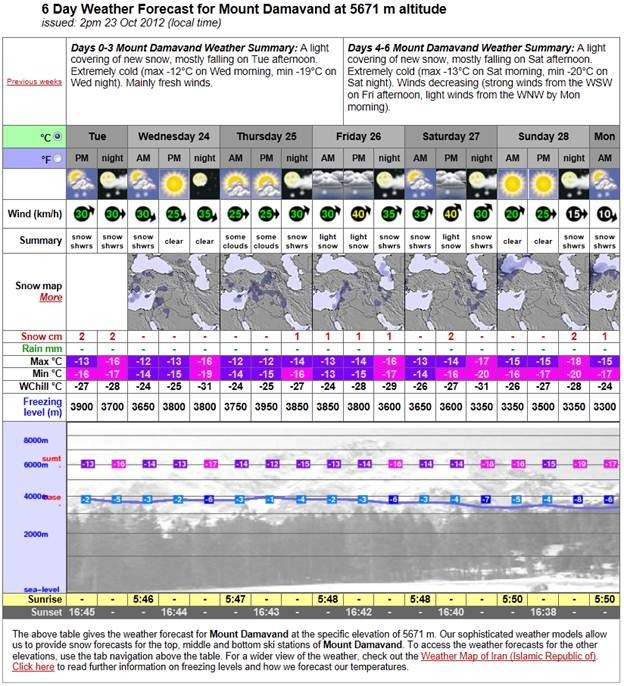 There is light snow expected to fall from Friday so I have to cope well with the altitude not to delay the summit push. North-East route is a popular summer route. It goes through the North-East ridge that is called Takht-e-Fereydun. That name comes from mytghological story of Zahhak and Fereydun. There is a hut in this route at the altitude of 4300m. We will spend one night in the hut although we can spend two nights there for acclimatization. Then we’ll go up on the North-East glacier with a fantastic view of steep valley of Yakhar glacier right beside this route. After Gazanak village, go from right side of TALKHAAB river in gardens. After one hour you see a spring in gardens. You must take water. This point in the end of gardens .Then you must walk 2 hours and see a little garden and its spring. (This point is the best point for camping in winter) Then you must go forward (from right side of river) and see the last spring. This spring is named Pehen-Kooh spring. This is the last water in north-east route. In this point you see all of the remainder route and main peak of Damavand. From this point you must climb hardly. You can better eat lunch and rest little here and take water. Then you must turn to right on climb from right domain. Now you go up far from the river and bottom of valley. You must climb about 2 hours, so you see a very little spring in grade, you can rest here a few minutes and then go up to a rocky peak. Its name is Menaar peak (Menaareh, 3950m). Before the rocks, you must climb zigzag from a yellow and hard sandy way. Next you must go to round the rocks from left and go up from moraine (stones). When you reach top you will be at top line (4000m). Now turn left on and climb to shelter. After 1.5 hours you reach shelter. Its name is TAKHT-E-FEREYDOON shelter. This shelter in 4500m is solitary shelter in this route. From Haraz road to this shelter takes about 11 hours climbing. Now you are tried. The weather is cold and windy all times. You can rest to next day. If you have not water, you can bring ice from a glacier back of shelter. This shelter was made by students of Tehran University 1978 in commemoration of their friends. Next day you can stay here to harmony or climb to peak. After shelter the way is clear. First you climb a hill, then climb from a rocky way to top. After this rocks you see another rocks right hand to top. After rocks you must go from a way just top of deep canyon. This canyon is Darre-ye-Yakhaar. It is a glacier canyon. Your way is safe and you like to climb and see beautiful mountain. Here is above 5100m. So you climb from signs and way turn to right. You reach a glacier in grade. You must go across the glacier carefully. This glacier is named Aroosak-haa glacier. Climb and be careful. You smell sulphur and you are at 5500m. Then you see a big glacier named Do-bisel glacier. You must go across it very carefully. Now you are in North route of Damavand peak and near to peak. You climb slowly but after some minutes you will be at top of Damavand peak. From Takhte-Fereydoon shelter to top of peak is about 3.5 ~ 4 hours. You must photograph and return fast because sulphur is dangerous. Also weather is not stable. In return be careful, because two glaciers is in front of you. Also if you mistake in return way, you must go down from North route to other way. Be careful and follow your footprints on glaciers and see the signs .You must reach to Takhte-Fereydoon shelter and rest this night. You must wake up and eat breakfast and return to down, from shelter to village. If you want to return from same route, you can put your backpack in shelter and take a little backpack and climb to peak, but if you want to return from another route to down, you must carry your gears to top of peak and return from any route from top of Damavand peak to down. This is all for now, I will keep my FB and Blog site updated with my position and progress by using GSM networks and a satellite device. Please subscribe to my blog for updates on my adventures and send me positive energy and oxygen from the distance. I’ll be thinking on all of you from there and send you love and good wishes from the top… inshallah! The winter season may start from October to November and last to May and April. 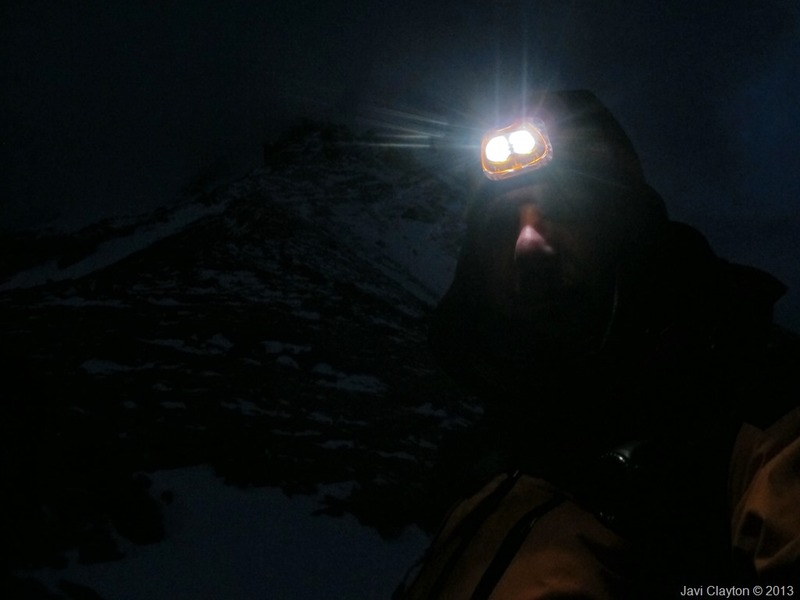 In this period climbing to Damavand summit is very tough and dangerous. Because of high wind speed and very low temperature, stormy weather conditions, too much snowfall, icy trails and other risks, winter ascend is graded as very difficult. The ski and snowboard season is from December to mid-May, the best ski months are March & April. 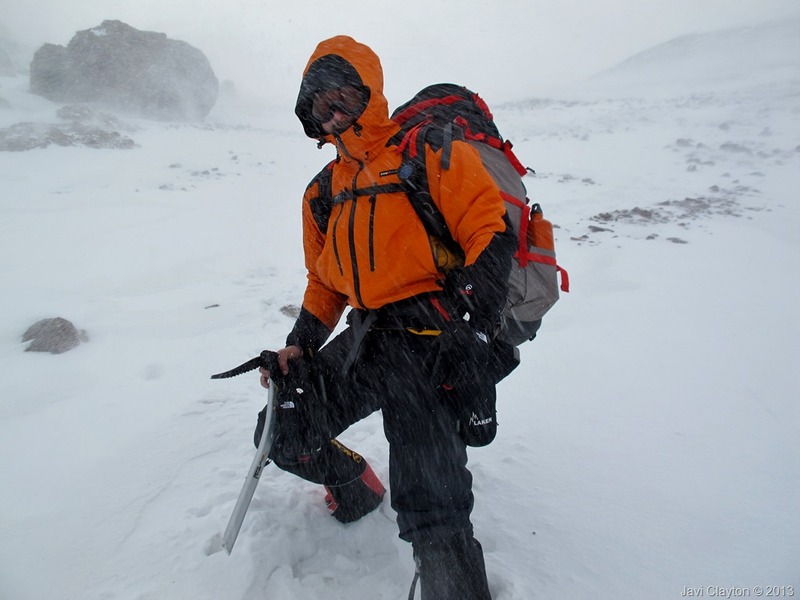 Weather condition in mount Damavand is harsh and severe in winter time. Since the end of October we expect snow fall in high altitudes, which means the condition is considered like winter. 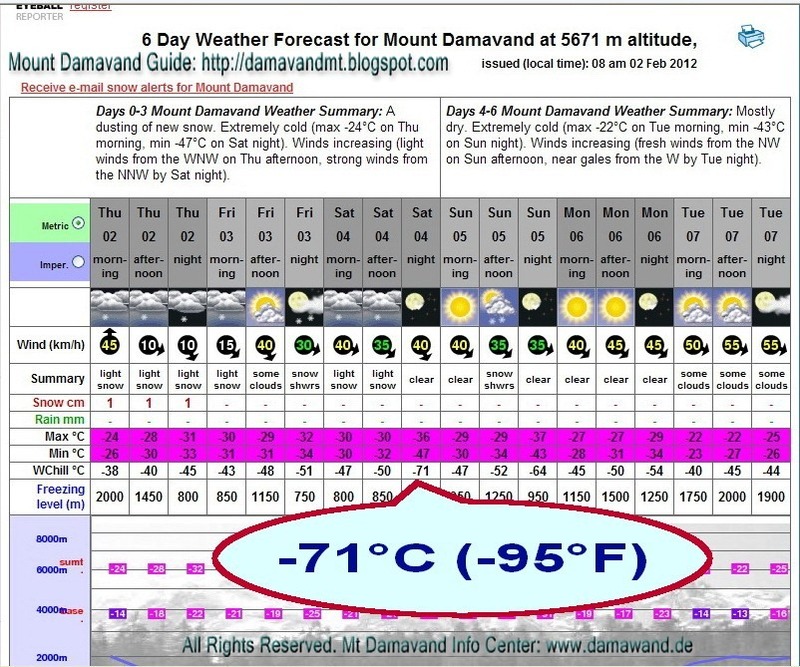 The temperature stays sub-zero till next June far up in Damavand. 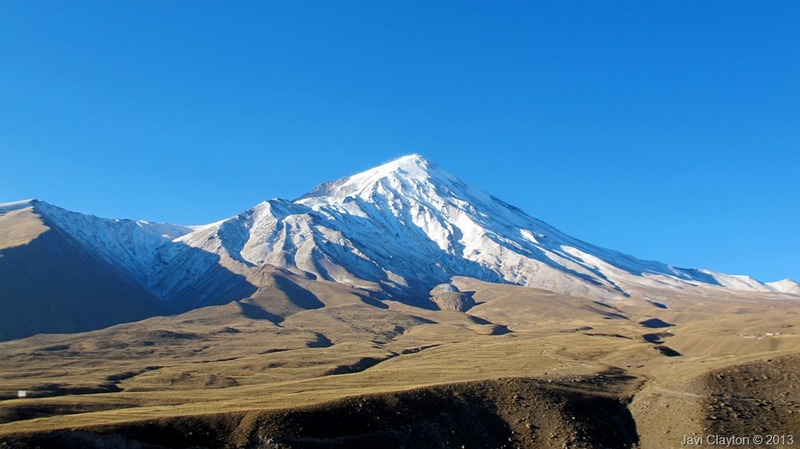 The south route of Damavand is the easiest route to access during winter. This route is not technically difficult, but still challenging in extreme conditions of very high altitude. Indeed, those people who have previous experience of winter mountaineering and are physically fit have more chance to reach to the summit, while the stable weather condition is an important factor, too. 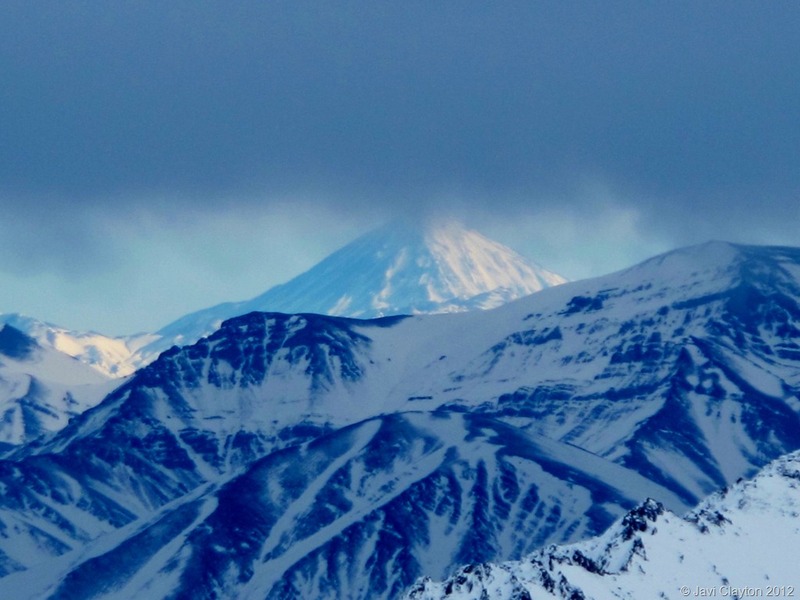 Damavand Weather could change to disastrous in winter, with strong winds more than 100km/h and freezing temperature below -70°C (-94 Fahrenheit). You must be well-experienced for such a difficult climb or ski mountaineering expeditions in harsh climate. Furthermore remember that rescue and medical facilities are not available in case of injury and emergency, so extra care should be taken for winter climbing and ski touring and it is done by your own risk. 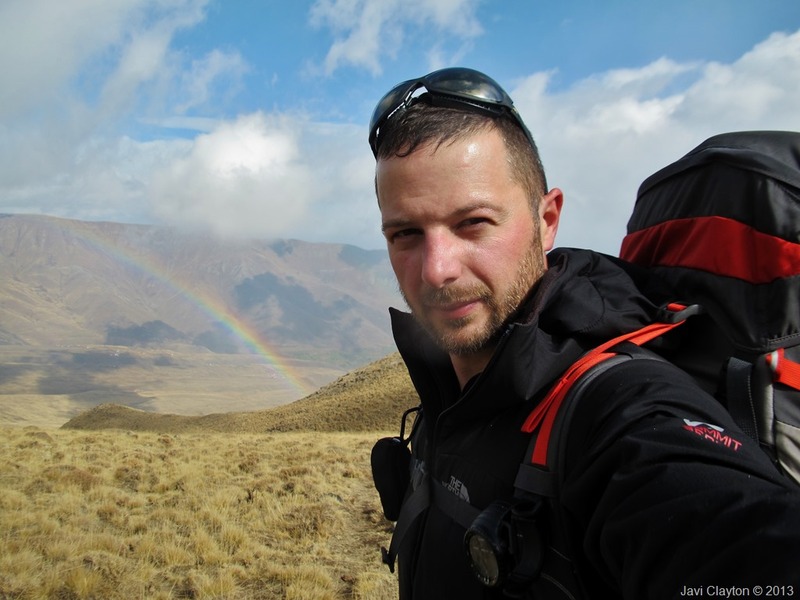 The weather has caused more deaths than any other factor besides bad judgment by climbers. Some climbers appear to rely on weather forecast reports or none at all, but one should note they are forecasts too, and one day their forecast will probably be wrong. In 1970 when Reinhold Messner attempted a winter climb to Mt Damavand Iran, due to adverse weather conditions failed, because he realized that despite a lack of technical difficulties, is not an easy mountain climbing, but a large and highly conditional alpine challenge. There are at least 16 known routes to the summit which have different difficulties. Some of them are very dangerous and require rock climbing. Three routes are popular with climbers: North, South and North-East faces which are adjacent to villages and all have shelters/huts in midcourse. The most popular route is the Southern Route which has step stamps and also a camp midway called Bargah Sevom Camp/Shelter at 4220m (about 13,845 ft). 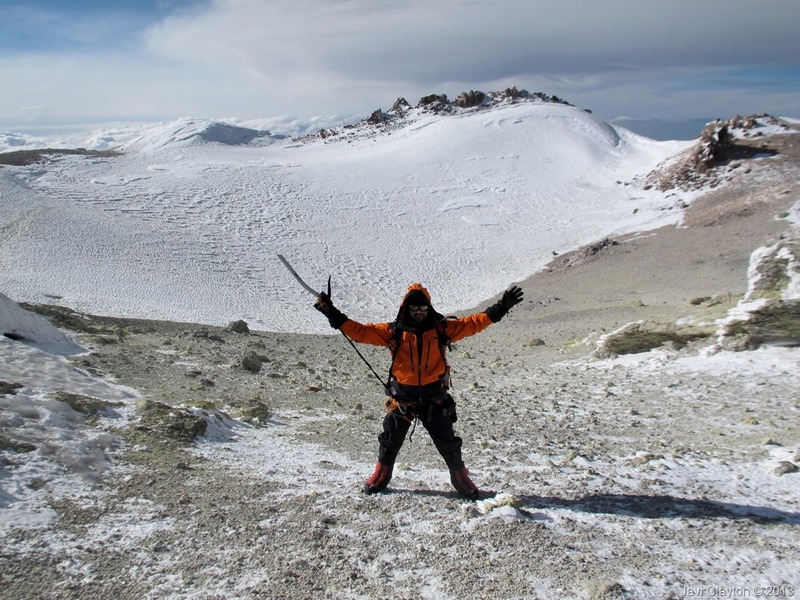 Damavand is often subject to intense west winds and experiences cold winters, so climbing in this season has always been challenging for domestic as well as foreign climbers. 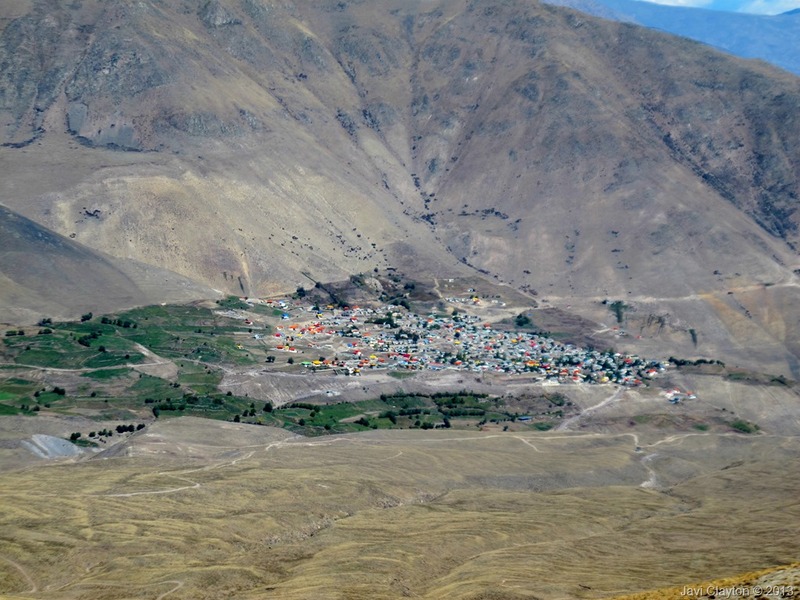 The best major settlement for mountain climbers is the new Iranian Mountain Federation Camp in Polour village, located on the south of the mountain. 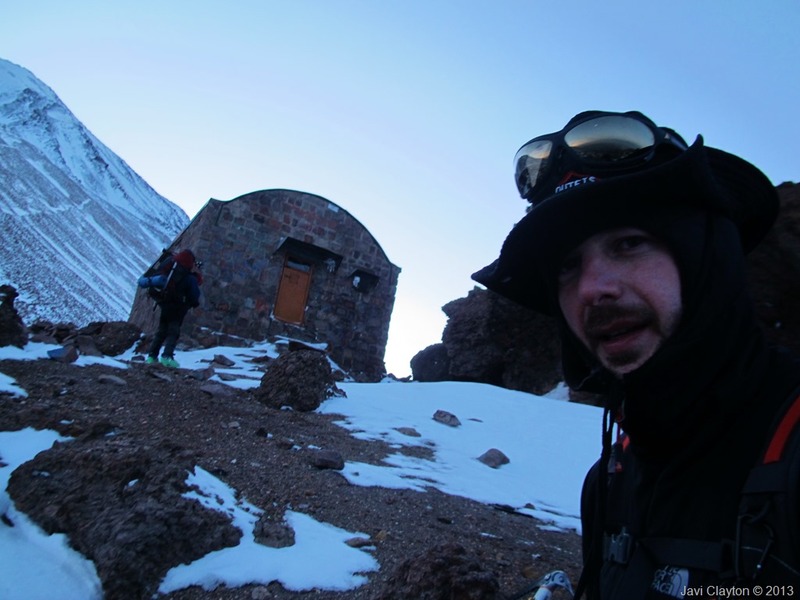 The longest route is the Northeastern and it takes two whole days to reach the summit starting from downhill village of Nāndal and a night stay at Takht-e Fereydoun (elevation 4300 m – about 13,000 ft), a two-story shelter. The western route is famous for its sunset view. Sīmorgh shelter in this route at 4100 m (about 13,500 ft) is a newly constructed shelter with two stories. There is a frozen waterfall/Icefall (Persian name Ābshār Yakhī) about 12m tall and the elevation of 5100m is the highest fall in Iran and Middle East. The North face has an extra shelter at 5000m. South Route: It is easily accessible from Tehran or North of Iran, the short distance from Tehran to the Haraz main road make southern approach the best trail. This is by far the easiest and the best side, and the ascent to the summit by this way is also shorter. Route type is basic mountaineering, with difficulty and climbing grade moderate, walk-up and easy descend. North East Route: Route type is mountaineering, with difficulty long and hard ascend with cold and wind and long descend. It has a shelter called Takht e Fereydoun at about 4500m. The refuge is called Panagah Simorgh in Persian. West Route: West route type is basic mountaineering, with difficulty and climbing grade moderate walk-up, basic snow and cold and difficult descend. There is a refuge at 4200 m called Simorgh Camp. The shelter is called Panagah Simorgh in Farsi. Simorgh means Roc, a gigantic legendary bird said to carry off elephants and other large beasts for food. It is mentioned in the famous collection of Iranian tales. 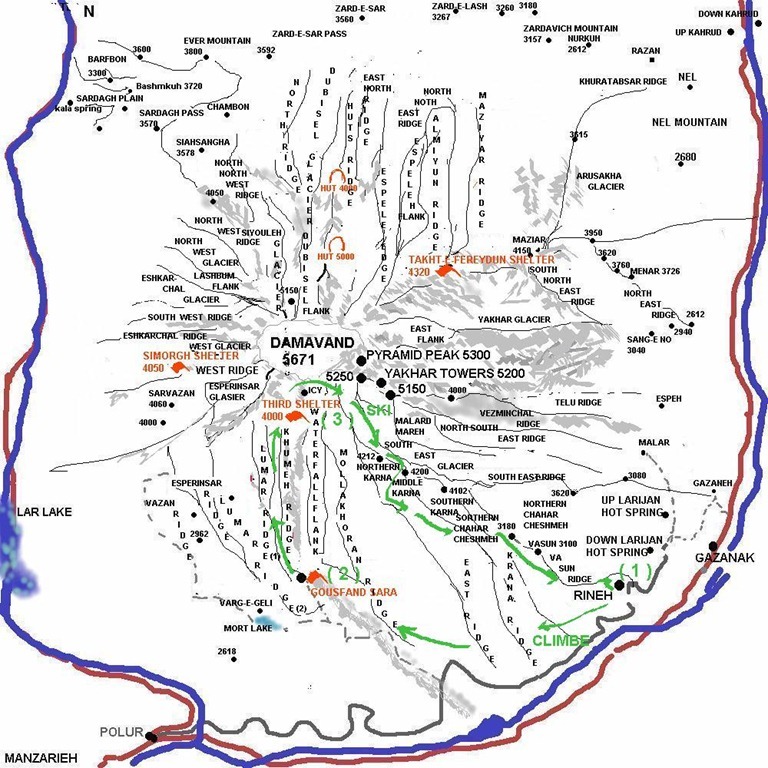 North Route: The north face is the most difficult side of Mt Damavand with difficulty and climbing grade scramble mountaineering, steep, hard ascend, depending on season, cold and windy, snow & ice, difficult descend. It has two shelters called 4000 and 5000. Please note that these grades are Mount Damavand Guide opinion only, there are usually differences between grading in different climbing routes. Regardless of the system used, all grades are an approximation. Mt Damavand shape is conic like many other volcanos, it looks like Fujiyama in Japan, but much greater, with the altitude 5671 meters and a crater diameter approx 200 to 400m across and 30m deep, the crater has a permanent glacier which melts in hot summers and forms a small pool with little water. There is no shelter or refuge at the top, in case you want to challenge 7000 m or higher altitude you can make you own tent for acclimatization somewhere safe and away from sulfuric gases in or around the crater. The summit is made of lots of yellow sulfurous rocks and pumice stones, usually covered by ice and snow. This stratovolcano has some sign of volcanic activity at the top, a big vent was formed in 2007 just below the crater with high fumarolic activity, through which hot sulphurous gases emerge, releasing a significant amount of smoke and hot sulphuric gases. There are some major glaciers on Mt Damavand, these huge mass accumulation of snow and ice are formed during ages and are the main source of water for Talkh Roud River and the Lar Dam Lake, one of the main reservoir of fresh water for capital city of Tehran. These glaciers are mostly located on east and north face. It appears that some of these glaciers cannot qualify as a true permanent glacier because they may disappears during a very hot and dry summer. In the enormous Yakhar Valley in the east side of this volcano there is large glacier called Yakhar which is the most well-known and the biggest glacier of the mountain, it starts from about 3500 meters high to just below the summit, it has was climbed many times in summer but not in the winter. This glacier is the main source for Talkhrood River, ending in Caspian Sea. Chalchal Glacier and Arosakha, are other significant glaciers located on these sides. Two large glaciers are located on the north face, called Dobi Sel and Sioleh, the north route ridge passes between these two glaciers, which makes this route colder compared to the other routes. There is a small glacier on the south face in Kafar Valley (Kafar Dareh), called South Glacier or Kafar Dareh Glacier. It’s situated between south route ridge and Mollakhoron Ridge, it passes by Damavand Icefall. There are some small and none important glaciers on the west side which do not have particular names. There is a small glacier on the volcano crater, called summit glacier, mostly frozen, but in a hot summer you may see a little water in the crater. Just near the summit and under the crater, at the junction where south and east climbing routes join together, a big new vent was formed in 2007, which is still exhaling a great amount of smoke and hot sulfuric gases and steam with pestiferous smell, this makes some problem for climbing. Without adequate equipment such as oxygen mask, it is quite dangerous to go close to this vent, because if the wind changes its direction, you could get caught in the sulfuric poison gas. I finally have my flight tickets to Iran, and that means there is no way back for my next extreme challenge… I have two weeks more to train for a three days ascent to the highest volcano in Asia, and highest mountain in the Middle East, Mt Damavand. This beauty is 5610m high and I’m doing one the hardest routes in the north east face. Last year I did my first volcano in the States, Mt Rainier, 4392m in only two days, and it was the hell of a beautiful and hard climb! Few months before that I did amazing Island Peak in Nepal, with 6189m and plenty of days to acclimatize. This challenge will be physically extreme, since I’m climbing 580m less and I only have three days to complete what it normally takes 4… Time to test my lungs between the sulfuric fumaroles. Two weeks left for training… two weeks countdown starts just now!! !